If the stomach twists from bloat pressure, it can be unfixable and every owner of a deep-chested breed should be aware of the deadly potential of bloat! 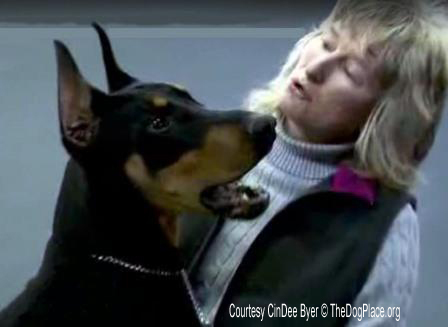 What can you learn from this Doberman fancier’s horrid experience of simple bloat ending in the death of a beloved dog that no amount of knowledge could save? Does anybody remember that garden of Eden that we all lived in with our first pet? We walked our dogs in the woods off the leash and they walked somewhere around us. We threw the ball in the hot sunshine and never worried about overheating. Our dogs slept where they wanted, chewed on grass, rocks, tree bark, bunny M&Ms and even field mice and we laughed. They guzzled water, rolled in mud, ran off in below zero weather but they always came home. Forty years after that first nibble at knowledge my husband and I have learned much. We have gained an abundance of knowledge only to have it become a coffin of hope. Hope leads us to believe we can predict and solve any problem that may befall our dogs. But… problems still enter our lives and prediction of them is not a cure. 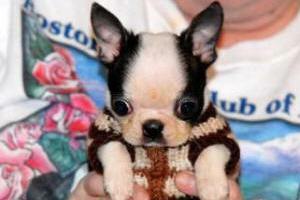 Knowledge is enlightenment of all that can happen in a dog’s life. We now worry about every sneeze, cough, burp, hick up and fart that our dogs make. We spend endless amounts of time and money studying everything about dogs and in particular our breed. Carefree play we used to enjoy has now been replaced with cautious apprehension. We worry the play is too rough, the running is too fast, the exercise is too much. We are concerned the water they drink is too cold, too warm or if they are gulping it. We wonder if the food they eat is good enough to meet their needs. We worry about vaccine reactions, veterinary medicine and ponder the myriad of health tests. We worry that lameness in a dog may be CVI or the cough may be cardio. Our worry never ends. The pinnacle of knowledge is the reality that we can control nothing. For my husband and I, knowledge came with the recent loss of a strong, wonderful young boy we called “XO”. 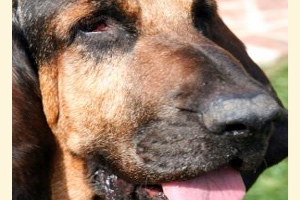 Bloat, which can lead to irrevocable gastric torsion, is not a stranger in the world of dogs. Bloat is something long time pet owners, breeders and exhibitors strive to prevent. In the event bloat should happen, we are confident a plan is in place. My husband and I believed we had the knowledge to keep our beloved dogs safe from that grim reaper. We monitored our old dogs closely, had a structured feeding, rest and exercise plan for all dogs. We kept our veterinarian’s clinic and cell phone numbers in our speed dial. We knew the processes that bloat goes through and the symptoms it displays. We even learned how to properly tube a dog and kept the equipment on hand. However, on January 20, 2016 our tree of knowledge fell upon us with a deafening crash. “XO”’ began stretching. It was a morning like all other mornings except for that unusual behavior. By 9 A.M. my obsessive worry about his behavior caused me make a personal call directly to my veterinarian. Other than the odd stretching, “XO” seemed normal; taking a treat, playing with his tail wiggling and ears up. My vet felt it was only gas and nothing to worry about. Throughout the morning we made a series of phone calls to our veterinarian and as “XO” continued stretching and I asked, “Should we tube him?” Our vet’s reply was “not at this time”. Our concern grew and at 2:45, XO’s attitude changed. My husband and I felt sure he was bloating. We could wait no longer. I called our vet to announce we would be arriving at the clinic for surgery. The clinic was closed so I called his cell phone. He apologetically informed me he was at an out of town appointment. My husband grabbed the tubing kit while I found the nearest emergency animal hospital. The tube was unsuccessful, meaning “XO’s” stomach had flipped, rotated, which means gastric torsion! My husband raced to the animal hospital while I stayed on the phone giving them information. Due to the fact XO was not displaying the usual symptoms, none of the medical professionals believed it was bloat but they agreed to x-ray which confirmed it. The life-saving surgery was performed by two veterinarians. They had to remove his blood engorged spleen but his insides looked good. That night XO was home eight pounds lighter but recovering well. Three days after the surgery we noticed dark red marks just off the left side of his incision. He was uncomfortable and would not lie down. We contacted the animal hospital and they assured us this was normal. My knowledge told me otherwise. I watched XO and worried about him for the rest of that week. With no progress the following week we took him for another exam. The veterinarian there felt he was healing normally and sent us home with more pain meds. Three more days went by and XO was still uncomfortable. The red marks were now turning black. We made another appointment with the animal hospital. That visit revealed that XO must have been burnt while warming him after surgery. The burns were determined to be severe and additional antibiotics were prescribed along with the antibiotics and pain meds he was already on. After this visit we treated the burns and they began to heal quickly but while medicating for the burns, XO’s attitude began to change. He was lethargic and no longer eating enthusiastically. Another call to the animal hospital was made and the vet there once again replied, “This is normal”. I was alarmed that XO was continuing to lose weight. From his normal of eighty pounds he was now down to sixty eight. I expressed this concern to the vets and they said it was “normal”. By the end of that week three things had taken a turn for the worst. XO was no longer eating. He was vomiting throughout the day and night. It was time for another opinion. We frantically called our own vet of 35 years, at his home, late on a Sunday night. He said “first, get him off all medications and meet me in the morning”. That morning our vet ordered a battery of tests. It was ultimately determined his stomach was ulcerated and he had developed pancreatitis. In the opinion of our vet this was possibly due to the overload of antibiotics. XO’s stomach had shut down and was no longer emptying. Covering all bases our vet considered the possibility that there also could have been a problem with XO’s stomach before the surgery or caused by the surgery. He could not know for sure unless XO was opened up again. XO’s eighty pound frame was now sixty two pounds, anemic, dehydrated and most likely not able to survive another surgery so we opted for medication to see if he would improve over the week. He did not and our vet thought it was time to let XO go. I reported these findings to the animal hospital that had done the surgery. The veterinarians there felt we needed to be more aggressive. They gave us steroid shots, anti nausea shots, eight medications, critical care nutrition and fluids to give XO over the weekend. It seemed this aggressive treatment was working but then it was not. The sparkle left his eyes. He was now fifty eight pounds, XO was worse than ever. So, on February 20th four weeks after the nightmare began we put our sweet, beautiful boy down. UKC CH Irongate's Love Wins Out stood quietly and patiently as he awaited relief. He looked deep into my eyes and then closed his forever. Through a flood of tears I told him what a good boy he was. I could not help but think with all my years in dogs and all the knowledge gained, I was not even able to save this one, young, beautiful boy. The only control we truly have is the memories we choose to make with our pets. Thanks to his wonderful breeder and my husband’s dedication, XO, in his short life, participated in forty-eight nursing home therapy visits. He earned his UKC Champion title with six Best Male wins, six Group One wins, two BEST IN SHOW RESERVE wins and two BEST IN SHOW wins. All this he accomplished in only eight shows total. He was AKC pointed. He performed dozens of commands including all Novice and Open obedience exercises as well as Utility hand signals. His photo was featured in TheDogPress.com for an article in support of “healthy docking and cropping”. XO was featured on the international television show INSIDE EDITION as a spokes “dog” for cropping and docking. Wherever XO went he was always a true ambassador for his breed. But, the memory I cherish most is how he stepped up into my lap every morning, pressed his head into my chest and allowed me to kiss his beautiful face tell him these words… “What a good boy you are”. Through the best and the worst of times, Joe and I would not have given away one of our days with XO. At times our pain is unbearable but sharing our memories takes us back to that Garden of Eden we used to play in. I hope this helps someone else treasure your loved ones, take nothing for granted, and learn all you can from the tree of knowledge but to understand the limitations of the knowledge you acquire.